You’re a new manager – congratulations! Managing a team is a whole new world of achievements and triumphs…but also plenty of new challenges. And mistakes. While a few first-time manager mistakes are inevitable with any new role, there are a few more common ones we can help you to keep an eye out for. And yes, there’s no shortage of “rookie manager mistakes” lists out there, but we’ve tried to go a bit deeper to find the bigger mistakes that can cost you a lot of wasted time, productivity and – most importantly – trust with your team. Here are five first-time manager mistakes to avoid – and what to do instead. You’re a star engineer. You’re the king of code. You’ve been praised time and time again for your initiative and creativity. And so you get promoted. Here’s a painfully common mistake that first-time managers make in their first few months: what made you a success as a software engineer won’t make you a success as the engineering manager. This kind of thinking can mean a new manager struggles with their identity and role, but also the direction of their team as a whole. How can you lead your team if you’re not 100% sure what direction you’re headed? To combat this thinking, Melissa recommends thinking about why you took the job or promotion in the first place. “You said, ‘Yes’ to a manager title. You said, ‘Yes’ to a manager salary. When you said, ‘Yes,’ what were the things that you were committing to?” she says. In other words, you delegitimize your new role. Maybe because you’re worried you’ll cause a morale dip if they pull rank. Or maybe because you’re still getting used to the change themselves, and you genuinely don’t think anything will change about their working relationships. Maybe it feels too corporate-y or even pompous to change the way you interact with them. But no matter what the reason, it will catch up with you. “When they’ve got an employee who’s just not going to work on the stuff that you need them to work on, they’ve lost their ability to say, ‘Here are my expectations and you’re a member of my team,’” he says. For example, the first team meeting after your promotion is a huge opportunity. Use that time to recognize that a change has happened, and you have new goals now. Outline your expectations for the team, and how you’ll be working together moving forward. Even if it seems a little awkward in the moment, it will be well worth it in the long run. We’ve said it before: don’t blame the meeting. Blame the manager. Why? If you arrive late to meetings (even with an apology), you’re setting the wrong example. If you say any of these things in meetings, you’re derailing productivity. If you don’t bother with an agenda, or taking notes, you’re setting the meeting up to fail. And we get it: good meetings don’t just happen like magic. It takes good habits (and an easy-to-use meeting management app 😏) – and it’s your job as manager to make sure those habits become a part of your day-to-day. Without them, it’s easy for meetings to become soul-sucking time wasters that your whole team dreads. Schedule regular one-on-ones with your team. Use the first one with each team member to explain why you’re doing them, and what your expectations are. If you have a manager README, include info on your one-on-ones in there too. Create a culture of sharing by encouraging the feedback to flow in both directions. You’ll learn more about your team, you’ll identify issues way sooner and you’ll boost engagement. All wins. Hear us out on this: there’s nothing wrong with feelings. But, when you’re a new manager, it can be easy to care too much about them – and that can have disastrous results. 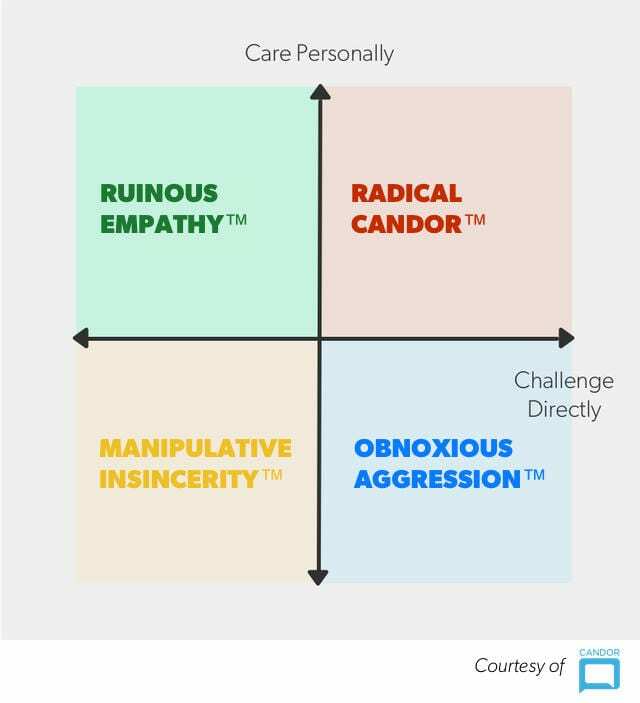 The radical candor framework created by Kim Scott warns against ruinous empathy: when someone is trying to be nice to spare someone else’s feelings.